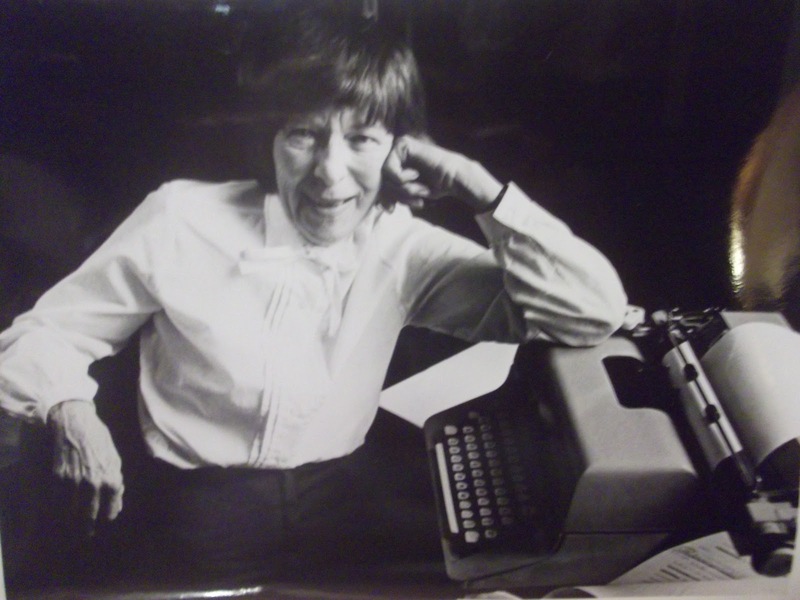 Today’s letter in the first Really Like This Book’s podcast A-Z series is H, and today’s author is Helene Hanff (1916-97), oh blessed be her name. She spent her life trying to become a Broadway playwright, and ended up writing a best-selling novel about her relationship with a London antiquarian bookshop from the 1940s to the 1960s. 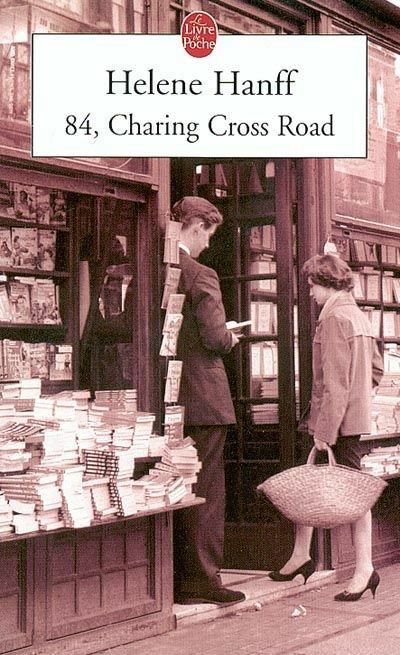 84 Charing Cross Road was published in 1970, and was an instant success. It became a TV series and a highly successful West End play (but flopped on Broadway). It was so successful because it is a book of instantly readable, delightful, funny, moving, revealing, instructive and downright normal letters. 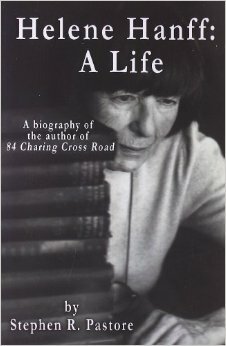 In 1946, an impoverished book-lover scraping a living in New York, Helene Hanff started to order obscure books of English literature from the London firm of Marks & Co. She was a passionate Anglophile, and wanted to have real English books that she could afford rather than pay a fortune for horrible American reprints. She and the shop’s manager, Frank Doel, began a correspondence that is so lively on her part that it jumps off the page. Frank is more decorous and restrained, but any English writer would be in contrast to such a sparky American. 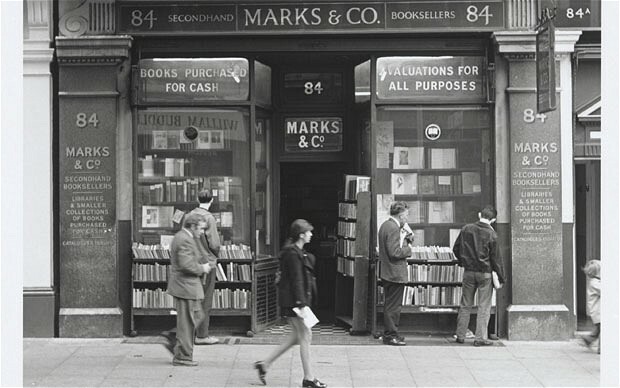 Marks & Co in 1969. It’s now a restaurant. Frank inadvertently reveals details of daily life in post-war austerity London in his letters, where rationing was still in place after the Second World War. These so horrify Helene that, as their friendships develops, she begins to send food parcels to the shop staff. The last letter in the book is written by a secretary (who didn’t know Helene), to tell her that Mr Doel died some weeks ago from peritonitis, and does she still want to order that book. It’s a heart-stopping ending. Everything that that letter implies – that Helene didn’t know Frank was ill, that this is the brutal end to a very warm friendship (though not a love story by any means), and that there is nothing that Helene can do because she is so far away from Frank’s wife and family – is unsaid. It is so obvious, reading this relationship develop through the book, that she has lost not just a great friend but a long and important part of her book-loving life. I first encountered this novel in a Reader’s Digest volume at my granny’s house. There weren’t many books in my granny’s house: she got her books from the library, whereas I was a book-collector from childhood. We also had quite different tastes in fiction. Finding a book that I wanted to read in her dreary shelf of horrible liver-coloured Reader’s Digest volumes was surprising enough; finding such a treasure as this book was just amazing. I loved the way it was told in letters. Novels told in letters are a special form of literature, and can be more absorbing than a story told in conventional prose because the art of revealing the letter’s writer and recipient is so much more subtle. The classic epistolary novels of the eighteenth century can be rather long and indigestible (although I love Fanny Burney’s letter-novels). This tiny little twentieth-century book constructed of letters was a cross between a memoir and a novel, because it revealed so much about the lives and people. Once I started to think about who was writing the letters, I got hooked on the life story of the author. In the 1920s Helene Hanff was a Jewish stage-struck teenager from Philadelphia who won a theatre writing fellowship in the New York theatre. Her most memorable job was when she worked as a theatre press officer, and spent a whole night adding exclamation marks to a first-night press release when the producers decided that the new play needed one: it was ‘Oklahoma!’. Her favourite trick for getting into performances free (since she was always broke) was to wait, without a coat, in a café across the street from the theatre to be crashed that evening, until the first interval. The crowd would spill out into the street to smoke and drink, and then when they went back in for the second act, Helene and her best friend Maxine would go in too, mingling coatlessly with the legitimate audience, and see the remainder of the play from seats abandoned by theatregoers still in the bar, or on their way to somewhere more entertaining. When the story departments of the Hollywood film companies finally moved to the West Coast where the studios were, Helene started writing for television instead, since they were still based in New York, and when those story departments finally moved west too, she was out of work. 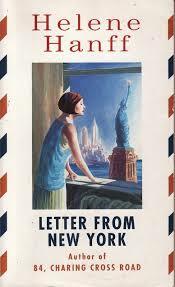 I don’t know why she didn’t move to the west coast as well, but since most of her other books are about her passion for New York, this suggests that her location was more important than her job. She seems to have lived a very precarious life financially, juggling bills for dental treatment with the rent, but she is very careful to reveal only what she wants us to know. We hear nothing about her love life, ever. We know she had two brothers, but we know nothing about them or about her parents. The one great friend that she talks about in the memoirs is Maxine, but there were certainly others: they flit namelessly in and out of the narratives to give an impression of a happy sociable Helene, but also a workaholic and rather solitary Helene, who always lived alone and was quite happy working and living in a small apartment for all her life. At the time in her life when the script-writing had dried up, and nobody wanted her to make any more adaptations of episodes from history for TV scripts, Helene had no idea what to do. She appears to have been a very stubborn person, determined to stick to one idea about one thing and not go back and have another think about it. She had insisted all through her writing life that she hated novels, she could only write about what had actually happened to somebody. She also insisted that she couldn’t write proper English, which was crazy, because she had made a career out of editing television scripts and writing to very particular deadlines: she knew everything about how to convey meaning in words effectively and memorably. The reason for this was her early training in English literature, picked up from, of all people, the writings of ‘Q’, Sir Arthur Quiller-Couch, an Oxford don and one of the great early popularisers of English literature as a subject for study: see my post about him here. Since Helene couldn’t go to college to study English literature (it was the Depression: she had to get a job), she had taken herself through a course of literature reading, guided by Q’s lectures, and realized that there were many, many authors, and books, in the long history of English as a literature, that she just had to read. But the New York libraries couldn’t supply what she needed (she had a passion for eighteenth- and nineteenth-century essayists), and she began to order books from Marks & Co, who had advertised their services as an antiquarian book-finding service in the New York Times Saturday Review of Books. When Helene, stuck for work, remembered Q, and remembered all her years of reading the classics of English literature, she figured that, OK, yes, she could write English properly after all. She looked at an old play that had relentlessly failed to sell, about the Oklahoma! exclamation marks, and rewrote it as a magazine article. It sold instantly, and she wrote another. Several articles later, Helene was being bossed about by a friendly editor who wanted her to write a book. Her confidence had returned, but she couldn’t think of a subject, something that had happened to her that she could write about. And then she got the letter from Marks & Co telling her that Frank Doel had died. 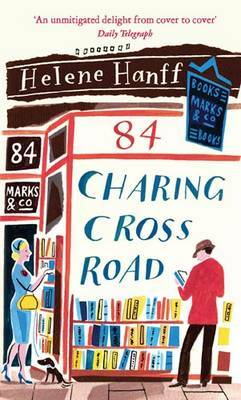 84 Charing Cross Road shows Helene at her brilliant best, first as a letter-writer over many years, to Marks & Co and to the friends in London she made through that book-hunting correspondence. Secondly, it shows her as a great editor, since the letters use moments in the development of a friendship to reveal the life of the poorer professional classes in London and New York after the Second World War. Thirdly, the letters show Helene as a great stylist. She uses upper case and lower case for emphasis, and reproduces faultlessly in words the outrage of a New Yorker who’s been sent the wrong kind of Vulgate Bible, or the abridged Pepys that doesn’t have the entry where his wife chases him around the bedroom with a red-hot poker. She teases Frank about his correctness, by insisting that he’s just sitting around doing nothing, he should go and do some work and find her some books. Her New York Jewish character erupts through the letters as well. The day after she posted her first food parcel, she tears off another letter because she’s only just noticed that ‘Marks’ of Marks & Co, is a Jewish name: is he kosher? Should she rush over a tin of tongue? She rages at the terrible edition of a New Testament Frank sent her, using the intonation and speech patterns of what I would later recognise as the Jewish mother. When I first read this book I had never even heard of kosher food. I had never seen a Woody Allen film, I didn’t know any Jewish people in my part of north-east Scotland, but when I read these letters I knew that I’d been introduced to one of the great humorous cultures of the world through her syntax. If you like the sound of 84 Charing Cross Road, but want to find out more about her, try Underfoot in Show Business, and Q’s Legacy. 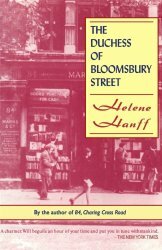 There is also a what-I-did-in-London book, called The Duchess of Bloomsbury Street, about when Helene finally gets to visit London, to see the BBC filming her book, and there’s also a book of New York reminiscences, Apple of My Eye. I’ve also found, to my great delight, that there’s a biography of Helene’s life, by Stephen Pastore, which I now have to read after a lifetime of vague guesses. A friend sent me the air-mail-cover copy from UK some time ago. I did not expected it ending in such way and sit there cried for a while. It has since become my favorite. Thanks for this essay on Helene Hanff. I read 84, Charing Cross Road many years ago and just read The Duchess of Bloomsbury Street. Like Hanff, I have been an Anglophile since I read Jane Eyre at 12. I recently visited London with my husband and two grown up children and felt just as Hanff felt upon leaving London — as if that beautiful city had been a dream. I don’t know whether Hanff ever returned to London; I feel as if she didn’t and I hope she could imagine the places she had seen and loved. Very pleased you liked it! I think I appreciated Duchess, and Apple of My Eye and Q, better the older I got. 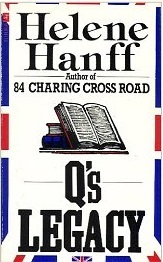 Hanff was a bit too cantankerous for me when I first read her as a teenager. Agreed. But now I am about the age Hanff was when she made her first trip to England so I identify with some of her peculiarities, especially with her complaint of “too much togetherness” during her trip to Oxford with the Colonel! Just stumbled onto your page, I am also a fan of Helene Hanff. Once when passing through JFK Airport, New York in 1992, I looked her up in the phone book and gave her a quick call. She was very gracious and appreciative. Lovely lady. Your article states her living 1916-1967, she died in 1997.